RE•WORK’s Deep Learning for Robotics Summit Highlights In-Depth Sessions and Connections – LET'S TALK ROBOTS! What a unique conference! 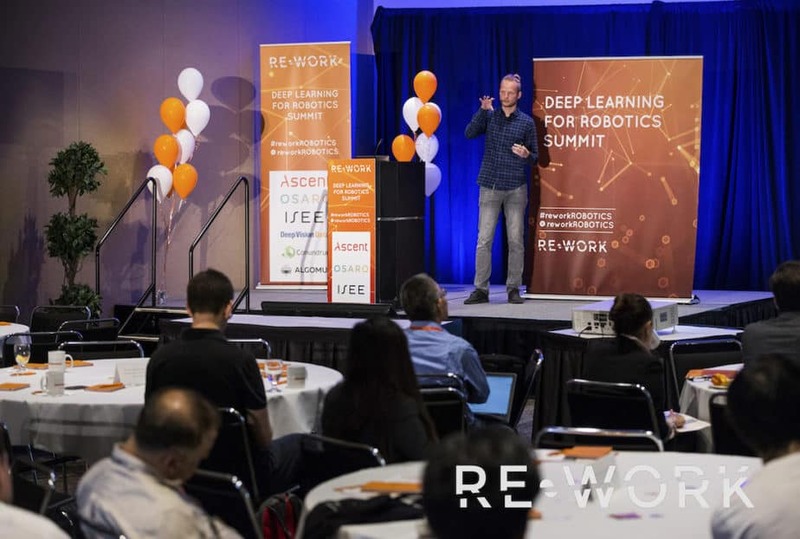 Sixty top-notch global speakers and 300 attendees/innovators interacted at the South San Francisco Conference Center on June 28 and 29 to share best practices to advance deep learning and the next generation of smart robots. 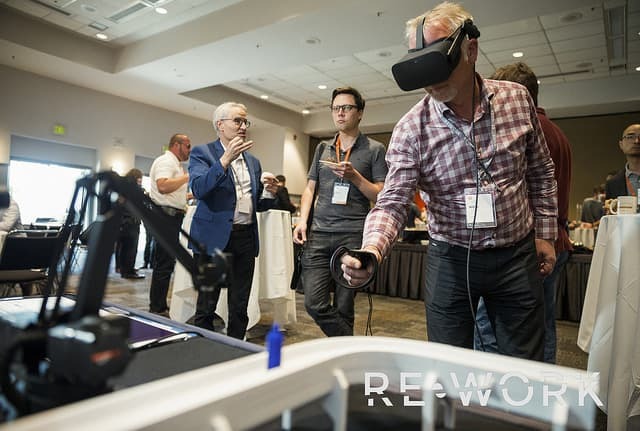 The event was co-located with the AI in Industrial Automation Summit giving attendees full access to two tracks of presentations, workshops, networking, and demonstrations on cutting-edge real-world applications and research. Day one of the Deep Learning for Robotics Summit featured topics in the current deep learning landscape, imitation learning, computer vision, natural language processing and reinforcement learning from industry leaders including Google Brain, UC Berkeley, Facebook AI Research, Stanford University, Uber AI Labs, Brown University, Carnegie Mellon and University of Southern California. “Imitation learning is more learning from demonstration – we want robots to be able to learn without actively requiring demonstration. When a baby learns from the TV, the TV doesn’t know it’s being imitated, it’s not doing an active demonstration. The abstract features you learn in a visual representation scenario are only as good as the labels you provide. It’s hard to weigh what’s actually most important. The second choice here might be unsupervised learning where you take an input image, encode it in continuous distribution, and reconstruct the original image. You can now avoid labels, and the image itself is the synthetic label driver. You don’t see people doing this in robotics because it’s challenging. The most appealing learning for us is self supervised learning where you combine the rich features of supervised learning, but without the labels”. Day two focused on robot startups and successful commercial applications of deep learning. Kicking off the morning was a presentation by Shay Zweig, head of AI at Israel-based Intuition Robotics entitled, “Lessons learned from Building a Social Robot” in which he explained their state-of-the-art algorithms that combines decision making, robotic vision, and dialogue management in order to personally and proactively learn about their first product’s, ElliQ, elderly owners. Silicon Valley startup Caspar is building an intelligent operating system for smart homes. Founder and CEO, Ashtuosh Saxena, described the home as “the biggest robot ever” for which Caspar is developing a coherent system that contextualizes the resident’s requests. Other Silicon Valley speakers from both the Robotics and AI Summit consisted of: Lionel Cordesses, AI Snr. Team Mgr, Renault Innovation SV; Thavidu Ranatunga, CTO, Fellow Robots; Samiron Ray, Principal, Comet Labs; Andrei Polzounov, Blue River Technology; Carlo Dal Mutto, CTO, Aquifi; Dan Yu, Sr. Research Scientist, Siemens Corporate Technology; Prateek Joshi, Founder, Pluto AI; Alicia Kavelaars, Co-founder & CTO, OffWorld; Binu Nair, Sr. Research Scientist, United Technologies Research Center; Modar Alaoui, Co-founder and CEO, Eyeris; and Alexander Harmsen, Co-founder and CEO, Iris Automation. Continued talent, talk, and tech of the Summits can be found in RE•WORK’s Women’s in AI Podcast, Interviews, and White Papers. RE•WORK is a female-led event organizing company that brings together breakthrough technology, cutting-edge science and entrepreneurship shaping the future of business and society. If you’d like to join one of their global events, such as the Applied AI Summit in Houston, simply use discount code SVR20. 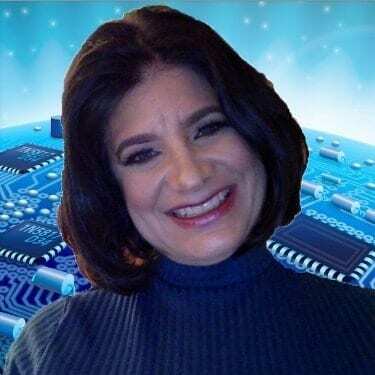 Welcome to our new author, Joanne Pransky, first Robotic Psychiatrist and Advisor to the Robotics Industry.